WatchGuard APT Blocker focuses on behavior analysis to determine if a file is malicious. APT Blocker identifies and submits suspicious files to a cloud-based next-generation sandbox, a virtual environment where code is analyzed, emulated, and executed to determine its threat potential. Modern malware including Advanced Persistent Threats (APTs) is designed to recognized and evade traditional defenses. APT Blocker's full system emulation - which simulates the physical hardware including CPU and memory - provides the most comprehensive level of protection against malware. WatchGuard has partnered with Lastline Technology as the best-in-class partner for the APT Blocker service. File Types Analyzed by APT Blocker §§ Adobe PDF §§ Rich Text Format §§Microsoft Office §§ All Windows executable files §§ Android executable files (.apk) §§ Proxies including POP3 APT Blocker not only provides a new level of protection against advanced malware, it does it in a way that's simple and intuitive. 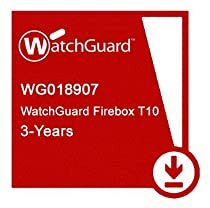 Thanks to WatchGuard DimensionTM, which is included at no additional cost in every WatchGuard XTM and Firebox® solution, you have strong zero day protection, plus real-time visibility with easy-to-understand information about threats impacting your networks..
Part Number is WG018907. Once purchased, you will receive an activation license by email and mail from SerenIT. This activation license is all that is needed to activate this product. WatchGuard APT Blocker focuses on behavior analysis to determine if a file is malicious. APT Blocker identifies and submits suspicious files to a cloud-based next-generation sandbox, a virtual environment where code is analyzed, emulated, and executed to determine its threat potential. Modern malware including Advanced Persistent Threats (APTs) is designed to recognized and evade traditional defenses. APT Blocker's full system emulation - which simulates the physical hardware including CPU and memory - provides the most comprehensive level of protection against malware. works with T10-W. Did you know that WG gives their employees T50's to mess with?